The sensory nervous system is a part of the nervous system responsible for processing sensory information. 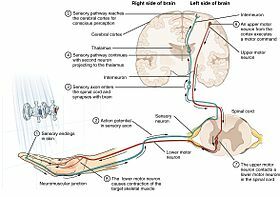 A sensory system consists of sensory neurons (including the sensory receptor cells), neural pathways, and parts of the brain involved in sensory perception. Commonly recognized sensory systems are those for vision, hearing, touch, taste, smell, and balance. In short, senses are transducers from the physical world to the realm of the mind where we interpret the information, creating our perception of the world around us. Organisms need information to solve at least three kinds of problems: (a) to maintain an appropriate environment, i.e., homeostasis; (b) to time activities (e.g., seasonal changes in behavior) or synchronize activities with those of conspecifics; and (c) to locate and respond to resources or threats (e.g., by moving towards resources or evading or attacking threats). Organisms also need to transmit information in order to influence another's behavior: to identify themselves, warn conspecifics of danger, coordinate activities, or deceive. The receptive field is the area of the body or environment to which a receptor organ and receptor cells respond. For instance, the part of the world an eye can see, is its receptive field; the light that each rod or cone can see, is its receptive field. Receptive fields have been identified for the visual system, auditory system and somatosensory system. Sensory systems code for four aspects of a stimulus; type (modality), intensity, location, and duration. Arrival time of a sound pulse and phase differences of continuous sound are used for sound localization. Certain receptors are sensitive to certain types of stimuli (for example, different mechanoreceptors respond best to different kinds of touch stimuli, like sharp or blunt objects). Receptors send impulses in certain patterns to send information about the intensity of a stimulus (for example, how loud a sound is). The location of the receptor that is stimulated gives the brain information about the location of the stimulus (for example, stimulating a mechanoreceptor in a finger will send information to the brain about that finger). The duration of the stimulus (how long it lasts) is conveyed by firing patterns of receptors. These impulses are transmitted to the brain through afferent neurons. While debate exists among neurologists as to the specific number of senses due to differing definitions of what constitutes a sense, Gautama Buddha and Aristotle classified five ‘traditional’ human senses which have become universally accepted: touch, taste, smell, sight, and hearing. Other senses that have been well-accepted in most mammals, including humans, include nociception, equilibrioception, kinaesthesia, and thermoception. Furthermore, some nonhuman animals have been shown to possess alternate senses, including magnetoception and electroreception. The initialization of sensation stems from the response of a specific receptor to a physical stimulus. The receptors which react to the stimulus and initiate the process of sensation are commonly characterized in four distinct categories: chemoreceptors, photoreceptors, mechanoreceptors, and thermoreceptors. All receptors receive distinct physical stimuli and transduce the signal into an electrical action potential. This action potential then travels along afferent neurons to specific brain regions where it is processed and interpreted. Photoreceptors are capable of phototransduction, a process which converts light (electromagnetic radiation) into, among other types of energy, a membrane potential. The three primary types of photoreceptors are: Cones are photoreceptors which respond significantly to color. In humans the three different types of cones correspond with a primary response to short wavelength (blue), medium wavelength (green), and long wavelength (yellow/red).Rods are photoreceptors which are very sensitive to the intensity of light, allowing for vision in dim lighting. The concentrations and ratio of rods to cones is strongly correlated with whether an animal is diurnal or nocturnal. In humans rods outnumber cones by approximately 20:1, while in nocturnal animals, such as the tawny owl, the ratio is closer to 1000:1.Ganglion Cells reside in the adrenal medulla and retina where they are involved in the sympathetic response. Of the ~1.3 million ganglion cells present in the retina, 1-2% are believed to be photosensitive ganglia. These photosensitive ganglia play a role in conscious vision for some animals, and are believed to do the same in humans. Pacinian receptors have large receptive fields and are the predominant receptors for high-frequency vibration. The end-bulb of Krause, or bulboid corpuscle, detects temperatures above body temperature. Ruffini’s end organ detects temperatures below body temperature. Nociceptors respond to potentially damaging stimuli by sending signals to the spinal cord and brain. This process, called nociception, usually causes the perception of pain. They are found in internal organs, as well as on the surface of the body. Nociceptors detect different kinds of damaging stimuli or actual damage. Those that only respond when tissues are damaged are known as "sleeping" or "silent" nociceptors. All stimuli received by the receptors listed above are transduced to an action potential, which is carried along one or more afferent neurons towards a specific area of the brain. While the term sensory cortex is often used informally to refer to the somatosensory cortex, the term more accurately refers to the multiple areas of the brain at which senses are received to be processed. For the five traditional senses in humans, this includes the primary and secondary cortices of the different senses: the somatosensory cortex, the visual cortex, the auditory cortex, the primary olfactory cortex, and the gustatory cortex. Other modalities have corresponding sensory cortex areas as well, including the vestibular cortex for the sense of balance. Located in the parietal lobe, the primary somatosensory cortex is the primary receptive area for the sense of touch and proprioception in the somatosensory system. This cortex is further divided into Brodmann areas 1, 2, and 3. Brodmann area 3 is considered the primary processing center of the somatosensory cortex as it receives significantly more input from the thalamus, has neurons highly responsive to somatosensory stimuli, and can evoke somatic sensations through electrical stimulation. Areas 1 and 2 receive most of their input from area 3. There are also pathways for proprioception (via the cerebellum), and motor control (via Brodmann area 4). See also: S2 Secondary somatosensory cortex. The human eye is the first element of a sensory system: in this case, vision, for the visual system. The visual cortex refers to the primary visual cortex, labeled V1 or Brodmann area 17, as well as the extrastriate visual cortical areas V2-V5. Located in the occipital lobe, V1 acts as the primary relay station for visual input, transmitting information to two primary pathways labeled the dorsal and ventral streams. The dorsal stream includes areas V2 and V5, and is used in interpreting visual ‘where’ and ‘how.’ The ventral stream includes areas V2 and V4, and is used in interpreting ‘what.’ Increases in Task-negative activity are observed in the ventral attention network, after abrupt changes in sensory stimuli, at the onset and offset of task blocks, and at the end of a completed trial. Located in the temporal lobe, the auditory cortex is the primary receptive area for sound information. The auditory cortex is composed of Brodmann areas 41 and 42, also known as the anterior transverse temporal area 41 and the posterior transverse temporal area 42, respectively. Both areas act similarly and are integral in receiving and processing the signals transmitted from auditory receptors. Located in the temporal lobe, the primary olfactory cortex is the primary receptive area for olfaction, or smell. Unique to the olfactory and gustatory systems, at least in mammals, is the implementation of both peripheral and central mechanisms of action. The peripheral mechanisms involve olfactory receptor neurons which transduce a chemical signal along the olfactory nerve, which terminates in the olfactory bulb. The chemo-receptors involved in olfactory nervous cascade involve using G-protein receptors to send their chemical signals down said cascade. The central mechanisms include the convergence of olfactory nerve axons into glomeruli in the olfactory bulb, where the signal is then transmitted to the anterior olfactory nucleus, the piriform cortex, the medial amygdala, and the entorhinal cortex, all of which make up the primary olfactory cortex. In contrast to vision and hearing, the olfactory bulbs are not cross-hemispheric; the right bulb connects to the right hemisphere and the left bulb connects to the left hemisphere. The gustatory cortex is the primary receptive area for taste. The word taste is used in a technical sense to refer specifically to sensations coming from taste buds on the tongue. The five qualities of taste detected by the tongue include sourness, bitterness, sweetness, saltiness, and the protein taste quality, called umami. In contrast, the term flavor refers to the experience generated through integration of taste with smell and tactile information. The gustatory cortex consists of two primary structures: the anterior insula, located on the insular lobe, and the frontal operculum, located on the frontal lobe. Similarly to the olfactory cortex, the gustatory pathway operates through both peripheral and central mechanisms. Peripheral taste receptors, located on the tongue, soft palate, pharynx, and esophagus, transmit the received signal to primary sensory axons, where the signal is projected to the nucleus of the solitary tract in the medulla, or the gustatory nucleus of the solitary tract complex. The signal is then transmitted to the thalamus, which in turn projects the signal to several regions of the neocortex, including the gustatory cortex. The neural processing of taste is affected at nearly every stage of processing by concurrent somatosensory information from the tongue, that is, mouthfeel. Scent, in contrast, is not combined with taste to create flavor until higher cortical processing regions, such as the insula and orbitofrontal cortex. Disability-adjusted life year for sense organ diseases per 100,000 inhabitants in 2002. ^ Krantz, John. "Experiencing Sensation and Perception - Chapter 1: What is Sensation and Perception?" (PDF). p. 1.6. Retrieved May 16, 2013. ^ Bowdan, E.; Wyse, G. A. (1996). "Sensory Ecology: Introduction". The Biological Bulletin. 191 (1): 122–123. doi:10.2307/1543072. JSTOR 1543072. PMID 29220219. ^ a b "eye, human." Encyclopædia Britannica. Encyclopædia Britannica Ultimate Reference Suite. Chicago: Encyclopædia Britannica, 2010. ^ Horiguchi, H.; Winawer, J.; Dougherty, R. F.; Wandell, B. A. (2012). "Human trichromacy revisited". Proceedings of the National Academy of Sciences. 110 (3): E260–E269. doi:10.1073/pnas.1214240110. ISSN 0027-8424. PMC 3549098. PMID 23256158. ^ Winter, R.; Harrar, V.; Gozdzik, M.; Harris, L. R. (2008). "The relative timing of active and passive touch. [Proceedings Paper]". Brain Research. 1242: 54–58. doi:10.1016/j.brainres.2008.06.090. PMID 18634764. ^ Thomas Brandt. "Vestibular cortex: its locations, functions, and disorders.". Vertigo. Springer. pp. 219–231. ^ McKeeff, T. J.; Tong, F. (2007). "The timing of perceptual decisions for ambiguous face stimuli in the human ventral visual cortex. [Article]". Cerebral Cortex. 17 (3): 669–678. doi:10.1093/cercor/bhk015. ^ Hickey, C.; Chelazzi, L.; Theeuwes, J. (2010). "Reward Changes Salience in Human Vision via the Anterior Cingulate. [Article]". Journal of Neuroscience. 30 (33): 11096–11103. doi:10.1523/jneurosci.1026-10.2010. ^ Downar, J.; Crawley, A. P.; Mikulis, D. J.; Dav (2000). "multimodal cortical network for the detection of changes in the sensory environment". Nature Neuroscience. 3 (3): 277–283. doi:10.1038/72991. PMID 10700261. ^ Fox, M. D.; Snyder, A. Z.; Barch, D. M.; Gusnard, D. A.; Raichle, M. E. (2005). "Transient BOLD responses at block transitions". NeuroImage. 28 (4): 956–966. doi:10.1016/j.neuroimage.2005.06.025. PMID 16043368. ^ Shulman, G. I.; Tansy, A. P.; Kincade, M.; Petersen, S. E.; McAvoy, M. P.; Corbetta, M. (2002). "Reactivation of Networks Involved in Preparatory States". Cerebral Cortex. 12 (6): 590–600. doi:10.1093/cercor/12.6.590. Wikimedia Commons has media related to Sensory system.